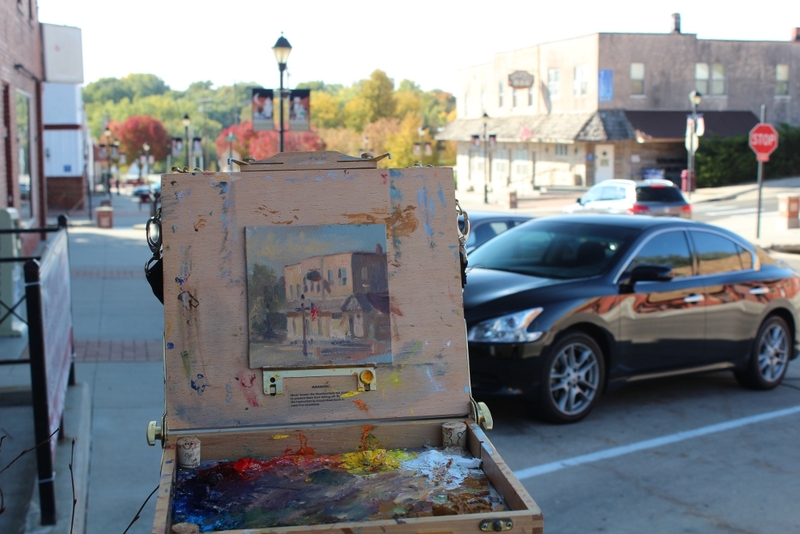 My friend and fellow artist (Deb Groesser) invited me this past fall to paint a small plein air for her local library fundraiser. The Ralston 100 Community Mosaic Art Project was Deb's idea and celebrated Ralston's centennial. The individual works of art were drawn,painted, or pasted onto 6x6 inch canvas. They were displayed together as one mosaic and for a small donation you could win one. It was a great idea and I was happy to participate. I set up in front of Deb's Studio on a freezing cold morning. 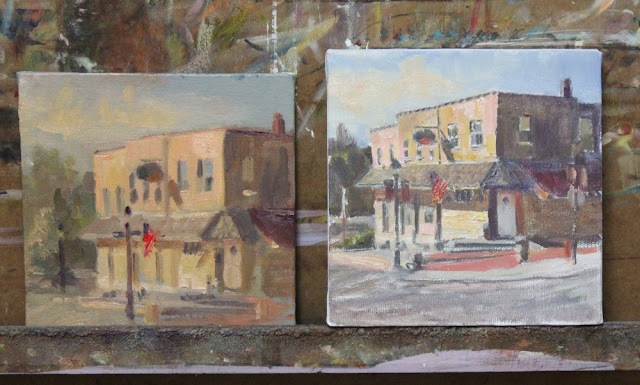 (Unfortunately Deb was away at some sunny California location painting one of her incredible plein air paintings.) I on the other hand was freezing my kaboodle off standing on the cold sidewalk painting a local street scene. 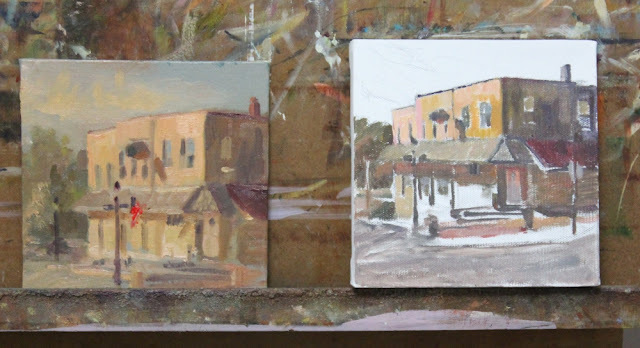 Once I got home and warmed up, I worked on the final 6"x6" canvas. The plein air sketch on the left was my guide. Not too much changed in the second version . I mostly just needed to clean and sharpen lines. 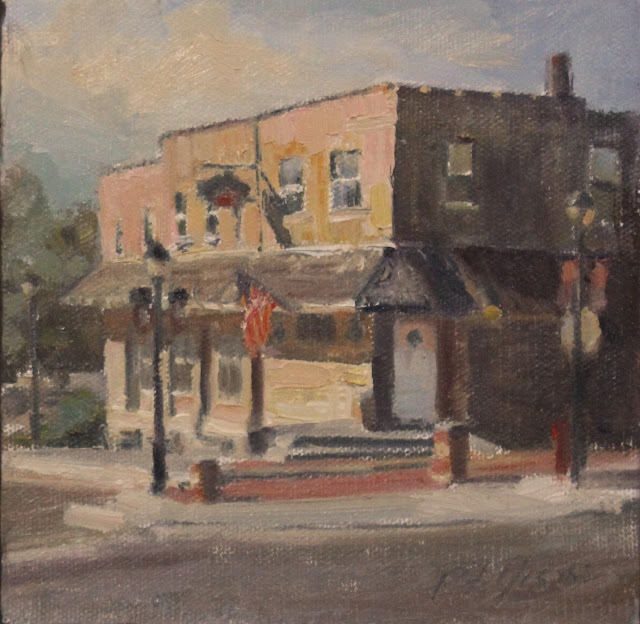 Great job, Peter...good to see you out in the field painting from life!